The heathland village of Brompton was first recorded in 1294 and its name derives from Old English words meaning ‘farmstead where broom grows’. The Royal Borough of Kensington and Chelsea’s coat of arms is topped with a sprig of broom repres­enting Brompton. The marshy ground was drained in the 16th century and converted to fruit gardens. The Brompton Park nursery was estab­lished here in 1681 and has given its name to the Brompton stock: a large, usually red, biennial variety of the species Matthiola incana. From around 1800 the area between Hyde Park and Brompton Road began to be developed in a piecemeal series of small streets and squares. Brompton Square was laid out in 1821, in a shape resem­bling something quite different from a square. In response to the village’s tumes­cence, the Anglican church of Holy Trinity Brompton was built in 1826–9 on the site of a burial ground belonging to St George’s hospital (which was then located at Hyde Park Corner and is now in Tooting). The area south of what used to be the continuum of Brompton Road and Old Brompton Road was originally more socially varied. Almshouses and working-class cottages have long since been replaced by grander dwellings, with archi­tec­tural influ­ences ranging from Tudor through Flemish to Italianate. A reputation for healthy air attracted a number of private hospices. The charitably funded Hospital for Consumption and Diseases of the Chest opened on Brompton Road in 1847 and has since moved south­wards and become the Royal Brompton. The neigh­bouring Royal Marsden was the world’s first hospital to specialise in the treatment of cancer. 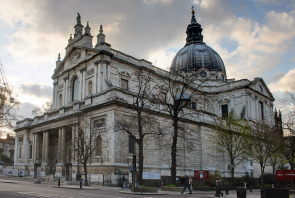 The London Oratory – collo­quially Brompton Oratory – is a group of Italianate buildings on Brompton Road and is the home of the London congreg­ation of the Oratorians, a branch of the Roman Catholic faith estab­lished at Rome by St Philip Neri (1515–95). The London Oratory was founded in 1849 by Frederick William Faber (1814–63), on the instruc­tions of Cardinal Newman, in a house in what is now William IV Street, Charing Cross. It moved to Brompton in 1854. The Museum of Manufactures was renamed the South Kensington Museum when it relocated from Somerset House to a purpose-built home on the site of the Brompton Park nursery in 1857. Designed by a firm of engineers and clad in corrugated iron, the museum’s three galleries looked so indus­trial that they were nicknamed ‘the Brompton Boilers’. The boilers were later replaced by the style conscious museum now known as the V&A. In 1868 the Metropolitan Railway opened Brompton (Gloucester Road) station, but after the Piccadilly Line arrived in 1906 Brompton’s name was dropped. There was also a Brompton Road station on the Piccadilly Line, between Knightsbridge and South Kensington, from 1906 to 1934. Because neigh­bouring Chelsea, Knightsbridge and South Kensington have such strong identities, Brompton’s name is little used now, except in the context of the insti­tu­tions mentioned above – and the cemetery in West Brompton. However, the area’s luxurious boutiques and eateries have been trying to resurrect Bromptonian awareness by inventing the ‘Brompton quarter’ and the ‘Brompton design district’. The focal point of this wonderland of wealth and good taste is Brompton Cross, where Brompton Road meets Sloane Avenue, Fulham Road and Pelham Street. 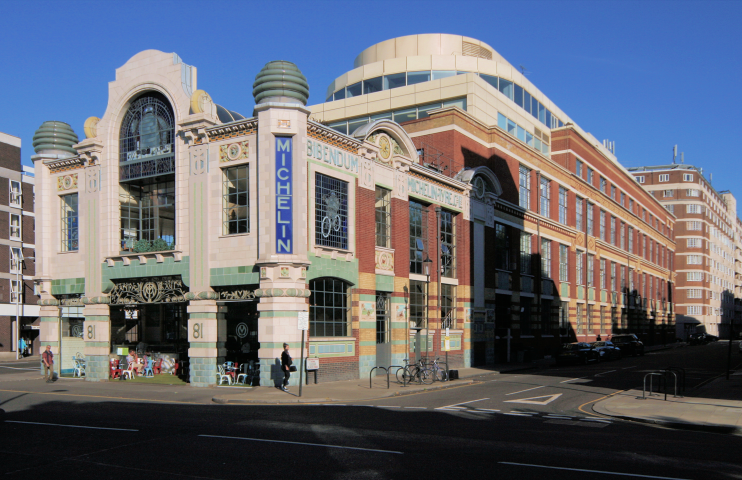 The landmark structure here is Michelin House, now home to Bibendum restaurant and shown in the photo at the top. At the 2011 census the ward of Brompton possessed an ethnic profile that is nowadays usually indic­ative of high status: a mainly white population of whom only are minority were British. Residents from North America and north-western contin­ental Europe (especially France) were partic­u­larly numerous. The ward has since been combined with Hans Town. A Brompton cocktail is a powerful painkiller and sedative consisting of vodka or other liquor laced with morphine and sometimes also with cocaine. The preparation is used to relieve pain caused by cancer and is said to be named after Brompton hospital, where it was first used for this purpose. The Brompton bicycle was conceived in 1975 by Andrew Ritchie when he was living in a flat with a view of Brompton Oratory. Full-scale production eventually began in the late 1980s at a factory in Brentford, where the company is still based. * The picture of Brompton Oratory is adapted from an original photograph by David Castor, at Wikimedia Commons, released into the public domain. Its reuse is therefore freely permitted, though the photographer would appreciate attribution.